Q. 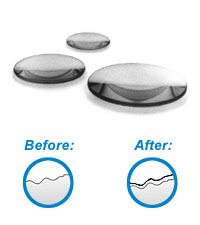 How do you clean wax marks on optical lenses which are difficult to remove? A. Use either 1% Alconox or Liquinox in a heated 160 deg F ultrasonic bath followed by a deionized water rinse to clean optical lenses during manufacturing. To learn more about Alconox, Powdered Precision Cleaner and Liquinox, Critical Cleaning Liquid Detergent, please visit www.alconox.com. For more information about any one of our Alconox Cleaners, consult the specific technical bulletin for each product HERE. Or click here to access each of our detergent’s Material Data Safety Sheets. You can also request a free sample by completing the questionnaire at Get Sample.